Happy Holidays! Chris Franklin and fellow Fire and Water Network All-Stars Rob Kelly, Siskoid, Bass, Ryan Daly and Nathaniel Wayne share their favorite Christmas toy memories! Merry Christmas! GREAT EPISODE Chris, and not just my part! I loved all the interstitial stuff you added as well–when you did the poems I pictured them in that Christmas Carol font that you see in comics when they did a holiday-themed story. And that story about your ear was deeply upsetting. I’m glad cooler heads prevailed and Fonzie did not get wrongly blamed. Thanks Rob. For the record, my Dad would have never shot our dog. But that was my kid logic. He still laughs about that, wondering what I thought of him at the time. That Netflix show looks AMAZING!!! I’m watching it first thing tomorrow…or maybe at midnight tonight! I want that Kenner GMTSW episode. Get on it Kelly and Daly! That show is amazing! I liked all the anecdotes by the toy designers and how some ideas were made so casually. “I want these figures this big!” (Engineer measures the exact width of the two fingers) thus the size of Star Wars figures were made. Great episode, everyone! It got me thinking about my toy memories (of which there are A LOT) but I have to say that one that stands out the most is the Christmas I got the Millennium Falcon. I’m not entirely sure, but I think it was the Empire packaging. It was the first toy that my dad let me put together all by myself, including the decals. That’s why the cockpit hatch was “battle damaged” and came off completely. That had to be one of the toys that I played with the most. No matter when I played Star Wars, that was there. I had many toys that had wrecked decals. But then I got into model kits, and if you can put decals as thin as fly wings on a WWII bomber, then you can handle the cockpit of a M.A.S.K. vehicle! That Millennium Falcon is a fantastic toy. Definitely a classic, and perhaps THE non-figure toy of the line. You jogged a memory with your responses to our bit, Chris – I did indeed get Castle Grayskull at Christmas time. Open wide, toothy door! This was a great deal of fun to take part in and listen to. Part of me had wanted to single out my He-Man toys, because they were such a huge part of my childhood (especially pre-Nintendo,) but the problem was they were so dirt cheap I got them throughout the year. Sure some of the bigger sets would be gifts, but I can’t sort out in my mind which were Christmas and which were birthday. I’m pretty sure I still have all of the mini comics that came with my figures (which I argue hold up a heck of a lot better than the episodes of the tv show do,) though I haven’t dug through all my packed away stuff to find them yet. I couldn’t even tell you all the ones I had, it’d probably be quicker to list the ones I didn’t. Like so many I sold them at yard sales to fuel more “grown up” habits (like video games) and many of those sales I now regret. I did hang on to a few, like some of my figures from the Snake Men line that Masters of the Universe did, they were just so dang cool. I went through a brief period of trying to rebuy ones I’d sold through eBay and the like, but quickly realized that if it wasn’t the actual figure I had that it just wasn’t the same. I was holding somebody else’s memory and that just doesn’t cut it. The one exception is the replacement I got for the very first He-man figure my mother ever bought me. That was important enough that I had to have that back in whatever form I could get it. And that figure? Well true to her standing as a life long hippy, it was the defender of nature: Mossman. I know he’s not the same figure I had as a kid, but he still gets a place of honor among my things that are out and on display. Because he deserves it. I loved Moss Man! He smelled like Pinesol! They just took Beast Man, flocked him like those old Christmas trees and sprayed him with air freshener, but it was like having Swamp Thing team up with He-Man, so I didn’t care! I don’t know what happened to my MOTU mini-comics. Most of them didn’t survive. I wouldn’t be surprised if I don’t come across them at my Dad’s house at some point. I have all my Super Powers comics, somehow. A great episode full of great memories. A memorable Christmas for me (probably) occurred around the time The Empire Strikes Back came out. My younger brother and I got a pair of inflatable lightsaber-like toy swords and two toy space helmets, one black the other white, which may have resembled Darth Vader and Stormtrooper helmets if you squinted, but they were the real deal as far as we were concerned. 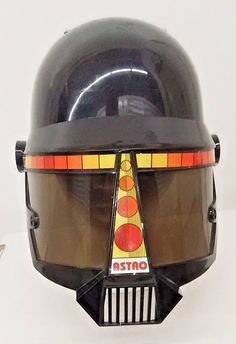 Whad’ya know, I was able to find an image of my old helmet (https://i.pinimg.com/236x/6e/07/0c/6e070c0a9cf97a3b905a4ecbb1551771–kos-helmet.jpg). Note to self, I need to figure out how to insert images into these posts. What black sorcery is this!?! There’s a bit of Kylo Ren in that. It foresaw the future! I was the youngest if 5 and we were always scraping to get by. So toys were a real luxury. And big expensive toys were almost nonexistent. I wish I could tell you the exact year but some time in the late 70s Shogun Warriors were the big rage. I craved one desperately. I was watching ‘Force Five’ and ‘Star Blazers’ on UHF here. And I would have killed for a Mazinga. It didn’t help my more affluent neighbor (single child) had Raydeen and Dragun. I asked Santa. I didn’t expect to get it. But I asked. That morning it was there in all it’s glory. Spaceship which landed in its head, missile firing fist, giant swords, the works. God I was thrilled. Now that was a Christmas. Those giant Shogun Warriors were unbearably cool. Some of the last toys that shot projectiles that REALLY shot across the room, and could leave a welp. That would make quite an impression under the tree! This was a wonderful episode! It gave me a lot of nostalgic memories as a kid. I wasn’t allowed to watch Star Wars either because my parents thought I would be scared of Chewbacca. Yet they still bought me the action figures. I can’t believe Rob got the Death Star, I didn’t know of any kid that owned one of those. We all dreamed of it. My favorite present was when we lived in Texas and my dad got me a B.B. gun rifle. It was just like the Christmas story (way before the movie) and my mom was afraid I was going to shoot my eye out. Which I almost did! It ricocheted back and hit my cheek. When I saw the film several years later it was a shock. My second favorite Christmas present was an Atari 2600, it was the cheaper model that Sears came out with. Pac-Man was such a let down on that console! Who was it that got comics in their stockings? I would have gone bonkers if I got that especially a Who’s Who! I only got life saver candy in this wear book-like box. Thanks again guys- awesome work. Thanks Lucien! That was me who got the Who’s Who! I always got a comic or two in my stocking. My mom…er…Santa saw Aquaman and just bought it, I’m sure. YOU ARE RALPHIE!!! Wow, that’s uncanny. I hope you didn’t put your target on a tin sign like he did! I expect that this community, and the wider comics-collecting community, are all prey to nostalgia. We have our Mountain comics, and our Beach comics, and other touchstone issues from our past. I find it enjoyable to think about, and remember those days, and I’ll bet anyone reading this does as well. That extends to other paths through memory. Holidays, departed family members and pets, and childhood toys. Your stories make me think of my stories. Chris, you and your peers were very lucky little kids, indeed. I was a kid in the early 70s. Before the onslaught of TV/toy synchronicity, and after the bulge of the baby boom, and their parents purchasing power. Sure, I got toys for presents. My sister and I would get a new Fisher-Price construct each year for several years. (House, Barn, Airport, Garage, Castle). Hot Wheels tracks one year, Tinkertoys another year. I didn’t get into comics until I was 12, and by then the idea of something like a Mego figure, a DOLL, was preposterous. Books, yes. Toys, no. I was 13 when Star Wars debuted, so I paid absolutely no attention to the merch. Well, maybe I coveted a little bit as I perused the JC Penney catalog. Nevertheless, even though I have no personal stake in any of the toys you discuss on this podcast, I enjoy each episode tremendously! Thanks, Chris! Thanks Ward! It’s extremely flattering to know you can enjoy the show without a similar frame of reference.